Bay windows add a third dimension to the living interior space. They are appealing from inside as they are from outside a home. A bay window simply makes the house feel larger and brighter. They invite the outdoors 'in'. Bay window can be traced to medieval architecture when windows were placed in the bay of castles' great hall. Bay windows are specially designed windows that create a niche in a home filled with light. We explore various bay window treatments and look at bay window curtain styles. Bay windows give an exterior expression of a bay within a structure. Bay in this context refer to interior recess made by the outward projection of a wall. Bay windows are typically three separate windows joined together to form one large viewing area. The center window is commonly fixed to a frame window or operating casement window which may be double hung or casement window which is fully operational. Of course, one can choose between fixed windows, vented windows or a combination of fixed frame and vented windows. Traditionally bay windows were three windows, with one large picture window flanked by smaller windows on the sides set at 30, 45, 60 and 90 degree angles. A bay window may be rectangular, polygonal or arc shaped. Each of the bay windows comes in a variety of angles and window options. Technically bay windows are most commonly used on the inside corners of the bay at 90, 135 and 150 degrees. The bay window forms a box which juts out from a house. This is often designed to be filled with plants and ornaments. The box is designed to start a little below head height and is usually installed over a sink or in a kitchen to provide light and view without disturbing the general shape of the house. This type of bay window is cheaper and comes as a standard model in trapezoidal shape. Full bay windows install a window seat and the resulting space is used to display art and other curios for instance. These bay windows are pretty large and often covering almost the entire distance from floor to ceiling. 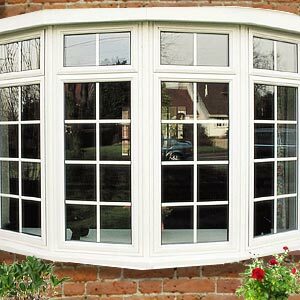 The distinct advantage of a bay window is that it can be installed in most large window opening allowing the home's appearance to change for the better. Bay windows dramatically change the feel of the room and provide the illusion of a larger room. They also increase the flow of natural light into a building. Bay windows are often designed with window seats so that people can actually sit in the windows. This is ideal as a private space for reading or sipping a cup of tea. Bay windows are available with canopies in fiber glass, PVC and light oak with decorative lead roofs. They come in different styling from clear glass to traditional. Bay windows are exceptionally energy efficient. They immensely increase the comfort of one's home by lowering the heating in the house. Sometimes a roof is built over the exterior of a bay window to give a dramatic look and seal against water penetration. Bay window curtains or coverings reduce sunlight, provide better control of lighting in a room, protect privacy and preserve furniture and wood floors from harmful sun rays. Window coverings also help reduce heating bills especially during winter times. Window blinds and shades dim a room along with visual privacy. In this context, plantation blinds offer exceptional control of lighting. Fabric, metal and wooden blinds help create various settings in a room. Shutter like Venetian blinds which may be mini, micro and slats and shade like honey comb, woven woo and Roman shades are a great choice in bay window coverings. Shutters are solid window covering panels. They comprise of top and bottom rails, side rails and louvers. Shutters made of polywood are also available. These are resistant to moisture, easy to clean and offer superior light control. Above all they are stronger than wood, termite proof and great energy savers. Pinch pleated drapes, insulated drapery panels with foam backing, tab top drapes, velvet drapes, simple valances, detailed cornices and a lot more…bay windows can be treated with a large variety of curtains and drapes. Each bay window reveals a unique set of circumstances and dictates what style of treatment should be used. A bay window can have inside mounted café curtains or Roman shades with contrast banding, tailored and traditional. Alternatively one can skip bay window curtains altogether and treat the bay windows with blinds and window topper such as a valance or cornice. Many interior decorators feel that sheer can be an excellent suggestion for bay windows. Sheers add elegance to window treatments. For a clean contemporary style that can catch individual attention is the Roman holiday style of treatment for the window. Here custom fitted Roman shades are used. This kind of dressing underscores the window's linear quality. It does not mute the bay's architectural lines. Roman shades can be mounted inside a window frame when a particular piece of architecture needs be high lightened. Choosing shades that have permanently pleated or hobbled quality brings a horizontal element to the bay's vertical nature. The grid gets softened by the fabric itself. A formal romantic window can be created by graceful swaggered valance which sort of unites the windows into one dramatic unit. First Published Date: 21 Dec 2007 Last modified Date: April 18 2019 This page may have been updated recently as new information is available or the content may have been edited for better readability.